I was skeptical of brown-rice pasta at first. I thought it would be pasty and have that 'health-food' taste. To my suprise, this vegan recipe came out so delish that I had to go back and make seconds! The pasta was firm and plump and could fool any Italian! For the sauce, I incorporated a new product that a friend gave to me as a gift. 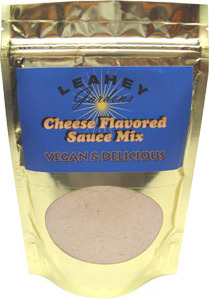 Leahey Gardens Cheese Flavored Sauce Mix. Wow! This stuff is the cheesiest sauce mix I've ever tried. The mix does contain wheat, so if you are going the way of the gluten-free, just use nutritional yeast instead. Meanwhile, in a saucepan, sautee the shiitakes and shallots in the tahini, and olive oil. Once the mushroom and shallots begin to brown, pour in the rice milk, and Leahey mix (or Nutritional yeast). Strain the pasta, and mix everything together! Top with some Parma ! Yum.